On the login page what if I can't remember my user name or password? Once you can login, you will have access to the Knowledge base and Support Assistance. Click the "Forgot your username or password?" link even if you are a new user. In the "Reset Your Password" section, enter your email address in the "Username" field. Click the "Reset my Password" link. 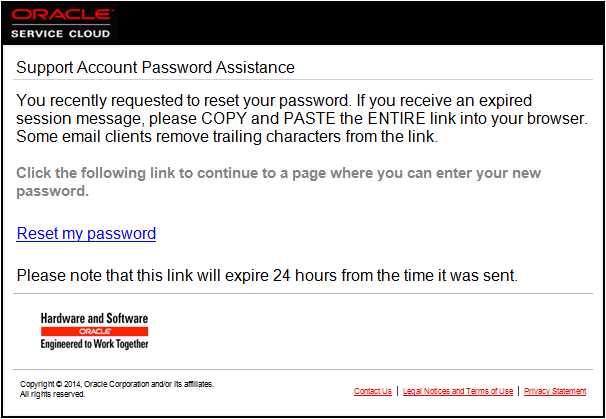 After you change your password and click Submit you will be logged into the support portal. Once logged in, please complete your support profile and change your password to something you will remember by going to My Account > "Contact Information" under the Profile heading. In order to obtain access to submit incidents, your organization should first identify your service contacts. Only contacts set up as designated support contacts can submit incidents.